bipole is a new action-puzzle game developed by gamesgames.com that combines a sugary-sweet graphical style and simple controls with some pretty interesting (and occasionally challenging) puzzles based on physics and polarity. Conceptually, it feels like a love-child of games like Collider and Sola Rola. Each level contains a certain number of “suns” and “moons” (positive and negative particles). All of these smiley-faced “balls” must be eliminated by crashing them into balls of the opposite polarity. You’ll be able to rotate the playing field, and can hit the spacebar at any time to lock the balls in place (or release them). You’ll need to use these tools (along with gravity and physics) to complete each level. The first few levels are rather simple; however it won’t be long before you’ll need to contend with switches, maze-like obstacles, and fields of energy that will change the polarity of any ball that comes in contact with them. In another interesting twist, balls of the same type (polarity) will repel each other, while opposites will attract each other. The gameplay itself is a mixed bag. Most of the levels are cleverly designed: Some will make you think, others will test your reflexes, and some will do both. That said, there are a couple of levels that I completed simply by twirling the playing field, without having to think about the solution beforehand. It’s just a fact that completing a puzzle by luck is not nearly as rewarding as figuring out (and subsequently implementing) a solution. 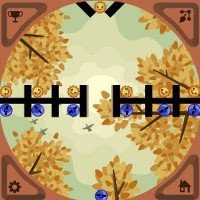 Overall, bipole is an accessible, visually-pleasing puzzle game with a few tricky levels, but nothing that will induce the need for post-game therapy. It’s well-crafted, and is a mostly-successful attempt at serving up some rather unique gameplay combinations.